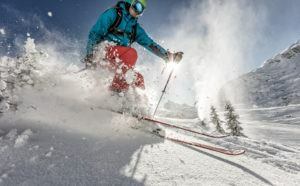 Cold temperatures and falling snow; signs that winter has arrived and reasons for winter sports enthusiasts to rejoice. Checking winter gear is important before heading out to ski, snowboard or ice skate. Warm sweaters and socks, check. Gloves, check. Helmet, check. But, what’s the status of the most crucial piece of equipment – your vision? Swooshing down the slopes requires fast reflexes. Reflexes are a direct result of what the eyes see and how the brain tells muscles in your body to respond. Having clear vision is vital for safety and ultimately impacts your ability to fully enjoy winter sports. Winter sports fans who rely on eyeglasses and contact lenses face challenges. Wearing glasses under goggles isn’t very comfortable and can increase the risk of injury to the eye during a fall. Lens fog is also a factor. Wearing glasses underneath goggles creates a poor seal that leads to all four lenses fogging. Prescription goggles are available and eliminate the need to wear eyeglasses but come with an expensive price tag. Wearing contact lenses on the slopes is a safer option but they can be tough to manage in winter’s dry, windy conditions and high altitudes. The vacuum pressure of well-fitting goggles also tend to make wearing contact lenses uncomfortable. Because of these distinct challenges, LASIK is a great option for winter sports enthusiasts with vision correction needs. LASIK is a safe procedure that provides quality outcomes with minimal recovery time. Patients enjoy clear vision immediately following the procedure and most return to routine activities the following day. You’ll be hitting the slopes in no time with a new sense of freedom and comfort as you enjoy the benefits of unlimited clear vision. If you have been looking for a solution that will make it easier to enjoy the winter sports you love, contact ReVision LASIK & Cataract Surgery for a complimentary LASIK consultation. A thorough evaluation of your eye health and vision is the best way to determine if you are a candidate for the procedure. Call 1.800.475.2113 or visit ReVisionEyes.com to schedule your consultation and ensure you have the best vision for winter fun.